Arinna Schall gives a demonstration of her tornado in a bottle to fellow students. Donna Diaz observes in amazement as a mini tornado begins to take shape. RONAN – Exploding milk, bouncing eggs, and square bubbles were just a few of the unique science experiments on display last Wednesday afternoon during the annual K. William Harvey Elementary School second grade science fair. The event is the culmination of four weeks of research and scientific study, and the students showcase their work in the school’s cafeteria for parents, friends and fellow students to see. Hakes said the science fair is a “good way to do some more hands on science” that may not otherwise be available in the classroom. 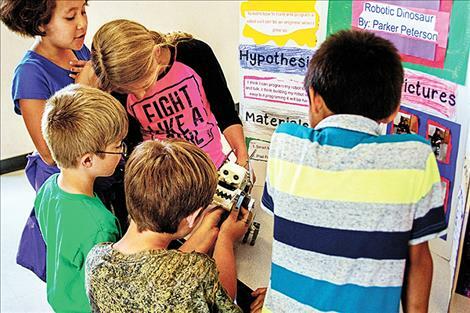 The second and fifth grade classrooms worked together on the projects once the students' topics were selected. The goal was to build an overall presentation by sharing the data results or conclusions from step-by-step experimentation. More than 30 projects were displayed in all with an array of subject matter ranging from the life cycle of butterflies, types of leopards in the world, how to make Oobleck, plant growth under various conditions, self-inflating balloons, lava lamps, volcanos, tornados in a bottle, robotics, rockets and UFOs. 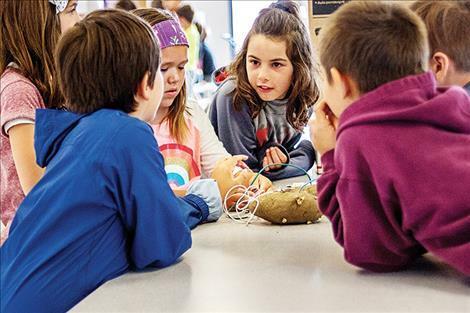 One of the experiments explored the prospects of an organic-plastic polymer resulting from mixing milk and vinegar together, while another exhibit just a few feet away demonstrated the power of the potato. 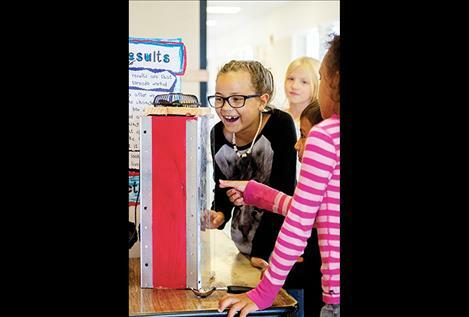 Second-grader Jayden Michel turned heads with his tornado simulator using a wooden box with a clear plastic window, a bowl of hot water, some dry ice and a fan. When the fan was turned on, a white cloud of quickly condensing dry ice began to swirl around and a mini tornado soon appeared. 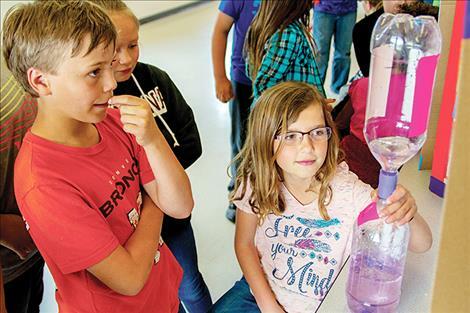 The four second-grade classes of K. William Harvey Elementary proved one hypothesis to be true: learning science can be a whole lot of fun.